Free stock trading is just the beginning. The ZeroPro platform provides users with the most advanced features needed by the active trading community. The platform allows traders to setup conditional and one cancels other orders, place GTC orders 24 x 7, filter stocks using the high low ticker, and includes decision support tools like advanced charting, Level 2 and a real-time news feed. It is an all inclusive package at a deeply discounted rate. Take a test drive today. 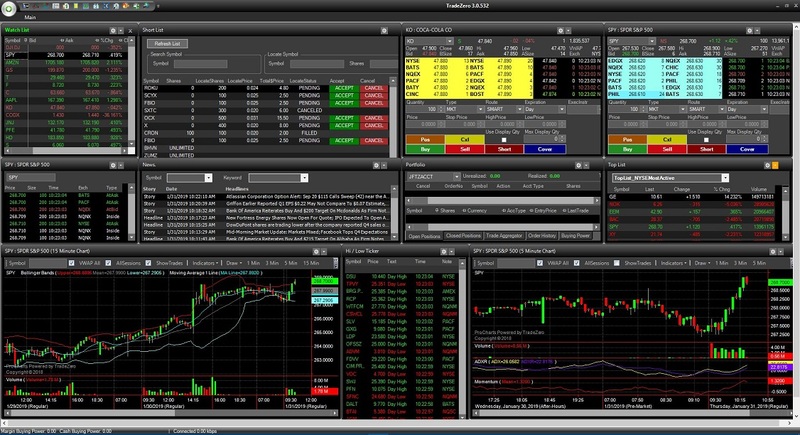 The portfolio window provides real-time profit/loss and account and order management. 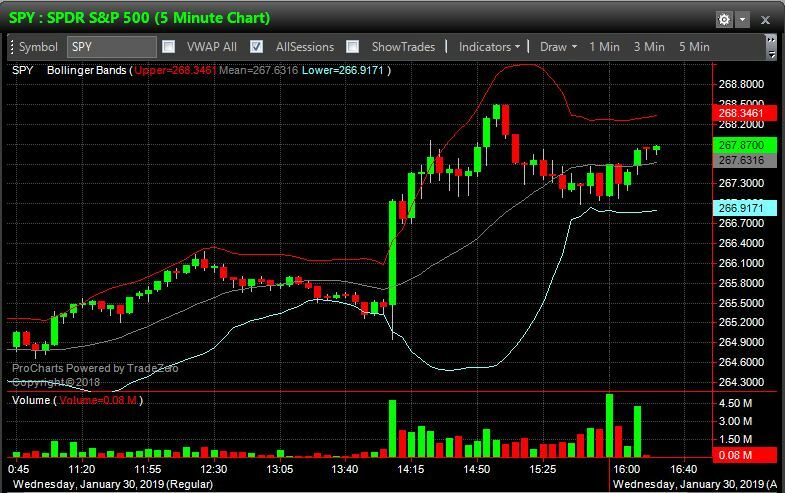 The window provides real-time information about open orders, executed orders, closed positions, realized and unrealized gain/loss, buying power, order history, real-time equity and the number of shares traded. ProCharts brings real-time charting to your fingertips. Built for speed and accuracy for active traders. Fully customizable and designed to perform in active markets. Add and configure over 70+ indicators. Highlight key trends, patterns and levels with our drawing tools. Traders can visibly plot entry and exit points on executed trades. Open active orders can be plotted on charts. 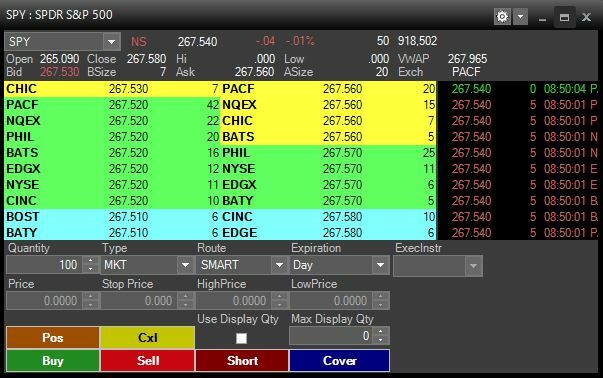 Level 2 shows market depth and the participants on both the bid and offer sides for all NYSE, AMEX, NASDAQ and OTCBB stocks. Enter orders to buy, sell and short stocks from the Level 2 window. Traders can Pre-load positions quickly with position button. Link level 2 window with other windows for quick information. Up to 6 Level 2 windows can be opened simultaneously. 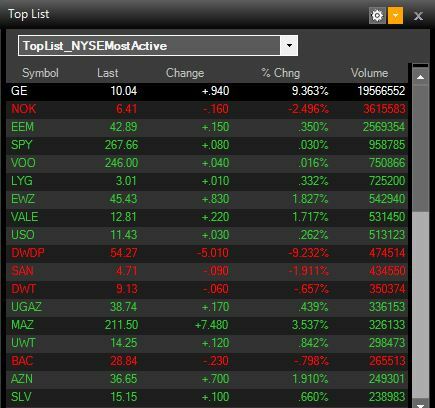 The Top list provides traders a list of 10 symbols that are most active, net change up/down, percentage change up/down in real-time for each US exchange, including OTCBB. 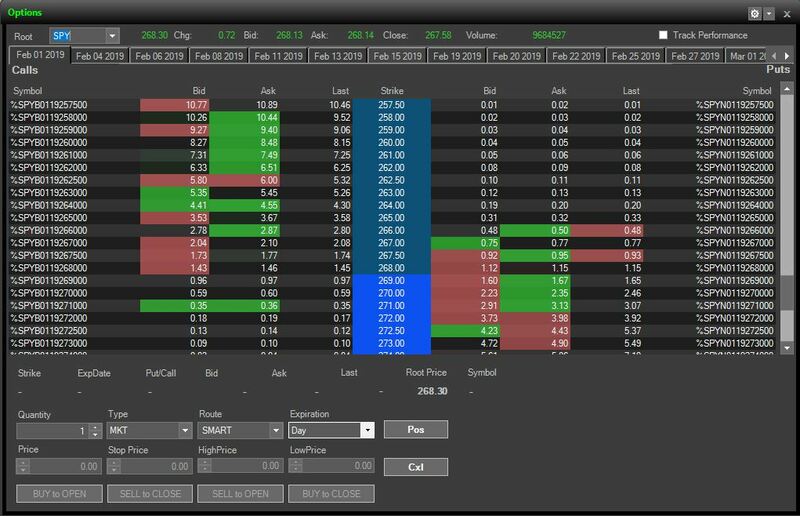 Time and Sales screen shows all trades and quotes that have taken place for a symbol. 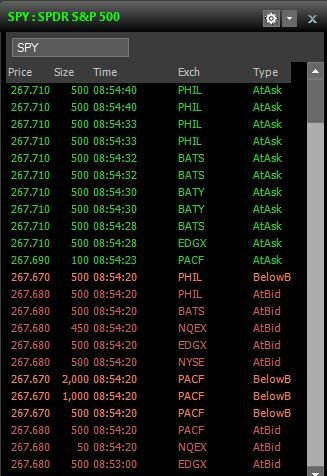 Trades are color coded to show whether they have occurred at the bid, at the offer, in between the bid and offer, or above or below the bid or offer. 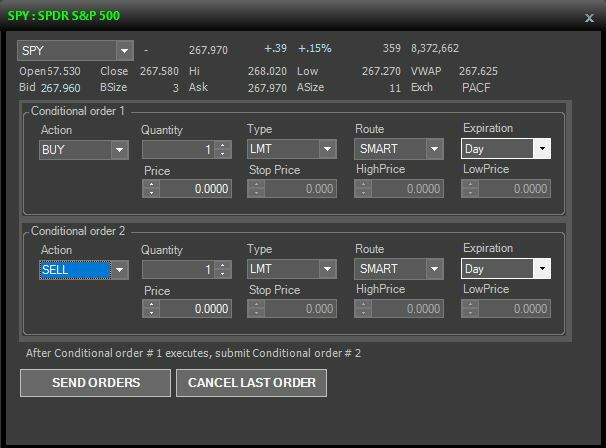 Custom watch lists to track stocks and Create Markets easily. The watch list dynamically updates tick-for-tick in real time. Column order and information can be changed. Audio and visual alerts can be set for price movements. 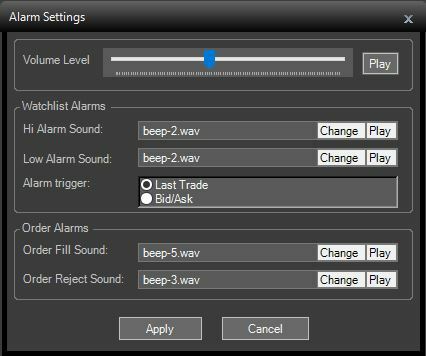 Configure and customize watch list and order alarm settings and triggers. The High Low ticker shows all stocks that are hitting their day hiygh and low as well as 52 week highs and lows. Traders can filter exchanges in or out, and can also refine results be filtering by price, volume and net change. Conditional orders allows traders to place an order and then if that order executes, place a new and separate order. Range orders can be used here to provide a third condition. Example: If GS gets to $200 a share but it, then put a limit to sell it at 205 and a stop loss at 195. If my limit or stop executes, cancel the other side. Shorting stocks has been made easier. 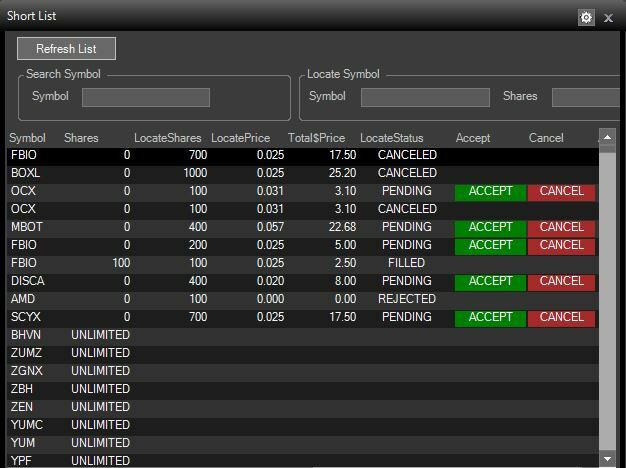 Traders can see the borrow tomorrow list in real-time and can also request hard to borrow locates on the fly. The combination of these two lists gives TradeZero clients access to over 14,000 symbols to short daily. ZeroPro offers traders the ability to trade options with either single leg, covered call or put or multi leg strategies, like calendar calls/puts, iron condors and butterflies. There are 17 different pre canned strategies or traders can choose to build their own.